The launch of our new Chilli Infused Oil last year reminded me of this dish which our family has enjoyed over the years. It is especially useful in asparagus season as we have a large asparagus bed, but broccoli works just as well. Make the sauce by chopping the garlic in a blender then adding the red wine vinegar, brown sugar, peanut butter, and soya sauce. Blend until smooth and then, with the machine running, slowly pour in the sesame oil followed by the Dunford Grove Chilli Infused Olive Oil. Use enough chilli oil to suit your tastes. Set aside while you roast the chicken and cook the pasta. Season the chicken, brown in a little olive oil on both sides and finish in a 180 deg C oven for about 10 minutes, or until the juices run clear when pierced with a skewer. Remove from the oven and leave to rest while you cook the remaining ingredients. Just before the pasta is cooked, tear the chicken into smallish strips. Place a large pan of salted water on to boil. Blanch the asparagus for 1 minute, remove and refresh under cold running water. Use the same water to cook the fettuccine until just tender. Drain and toss the pasta through the peanut sauce while warm. 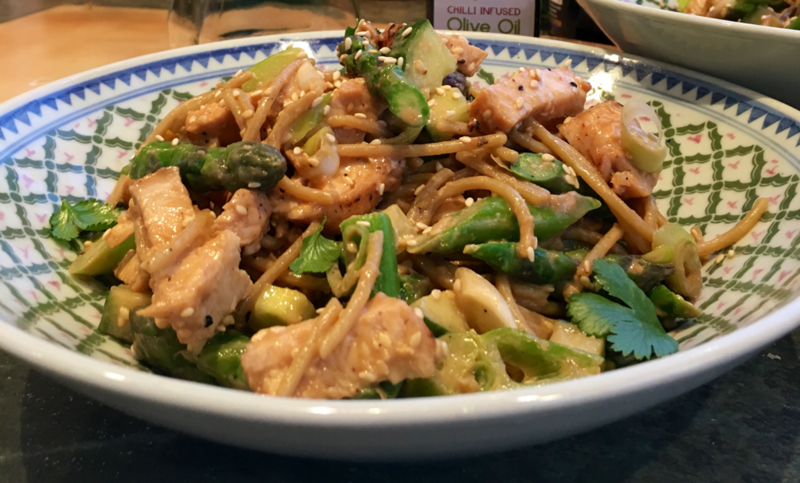 Add the shredded chicken breast, spring onions, asparagus and sesame seeds, reserving a few of each ingredient for sprinkling over the finished dish. Garnish the finished dish with the reserved ingredients and serve straight away. This dish is better served at room temperature rather than refrigerated.